I put apples in my pork. It’s fall, I couldn’t help it. Apples are everywhere right now. I’m not complaining, trust me. I love the darn things so much that I incorporate them into every meal. Apple breakfast hash (recipe coming soon) in the morning, apples and nut butter with lunch, and now apples cooked with pork for dinner. Poor CJ is afraid he’ll soon turn into an apple… which wouldn’t be the worst thing now that I think about it. Did I mention that I really love apples? Not just apples, by the way. You see, when I really like something I tend to go a bit overboard. Like in September with pumpkin (I turned a bright shade of orange) and now with apples… and applesauce and apple butter and apple spice muffins and apple tea and apple cider. APPLES, APPLES, APPLES!!! 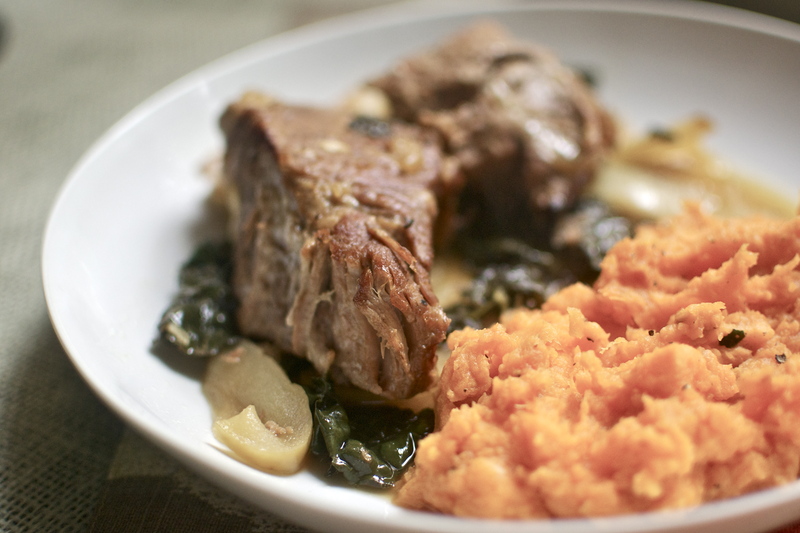 This dish is warm and comforting, and it really tastes like the current season. Make it and get on my apple obsession level so that we can talk all things apple. I want to know what I’m missing!!! What are you’re most favorite apple-y things?! Preheat oven to 325. In a large dutch oven heat half the ghee over medium high heat, and swirl to coat the pan. Sprinkle salt and pepper evenly all over the pork. Place the pork in the oil and brown on all sides. Remove pork from pan and set aside. Add remaining ghee to pan and swirl to coat. Add the sliced onions to the pan and cook until softened, about 5 minutes. Add garlic to pan and cook another minute. Pour in the vinegar to deglaze the pan, scraping up the browned bits. Add in the stock and cider, stirring to combine. Return pork to pan, cover tightly, and bake in the oven for 2 hours. 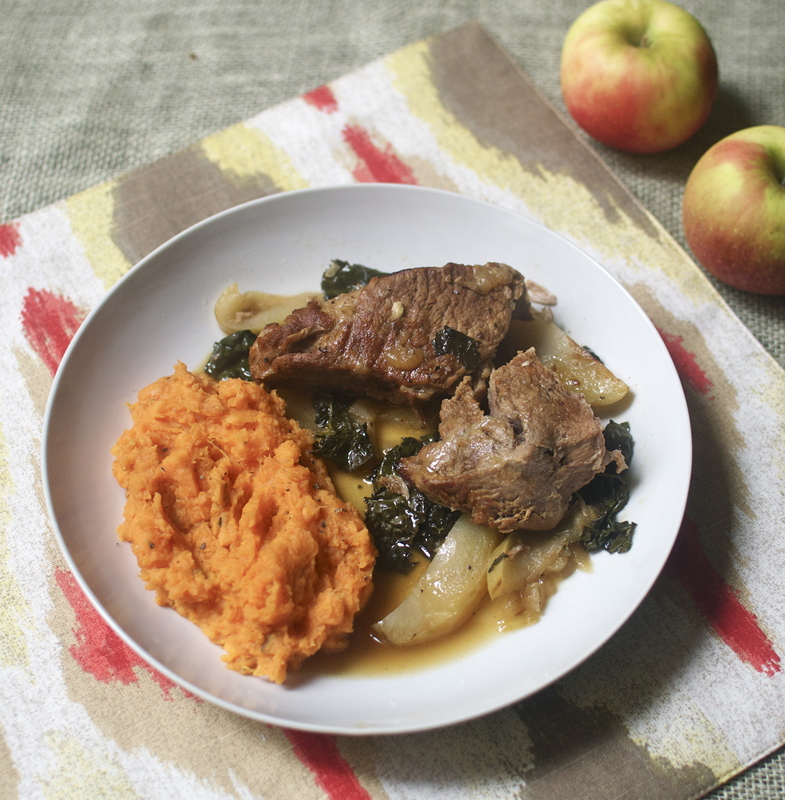 Add the kale and apples to the pan, recover, and bake an additional 30 minutes. Season with salt and pepper as needed. Serve and enjoy!! If desired, the cooking liquids can be reduced to make a nice thick sauce. Apples never tasted so good. 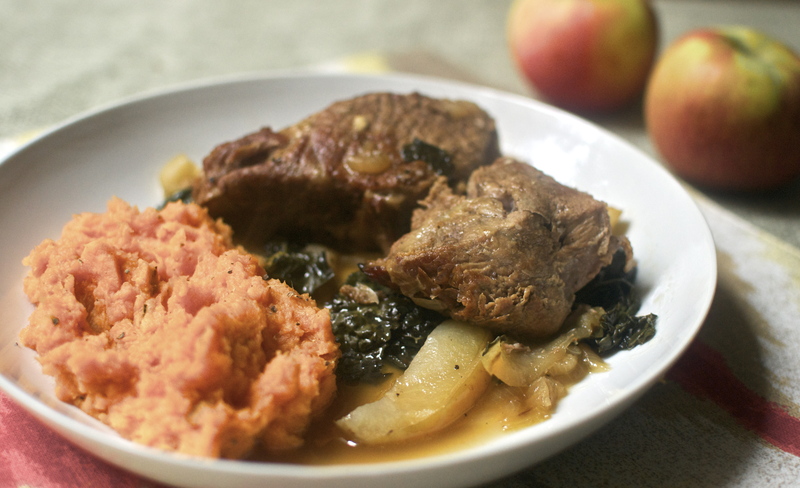 I love throwing apples and onion in with an inexpensive pork roast cut. A poultry rub, a bit of rosemary infused sea salt and a sprig of fresh thyme with a bit of good stock; a heavy cast iron casserole and a perfectly seared roast… doesn’t get much better. This is the season for slow roasts, inexpensive cuts of meat and fully incorporated flavours. Love fall… best clothes, best food. ohh, bet that would be super good!! Yum! This looks delicious – and easy to make! thank you! It’s super easy ! !